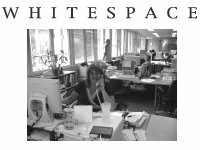 I founded Whitespace Software Limited in 1985. In 2006 I moved from a full-time role as Managing Director to be Chairman, leaving the day-to-day running to Andrew Sedcole and the team. Whitespace provides Database Systems for Insurance Companies. Our SYNOPSIS and ALMANAC systems are used by many companies in the Lloyd's of London market. In 2006 we took over Datarise, whose Claimsuite system is used by global claims management companies.